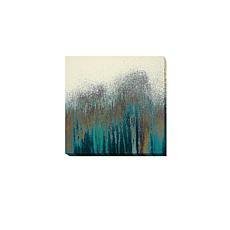 Teal Woods by Roberto Gonzales Gallery-Wrapped Giclee Canvas Wall Art Delve deep into these colorful woods. 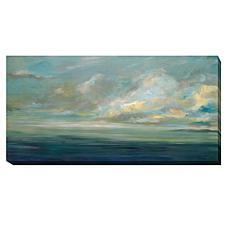 This captivating piece by Roberto Gonzales is a wonderful way to enhance your home or office décor. 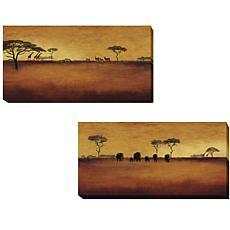 Serengeti by Tandi Venter 2-piece Gallery-Wrapped Giclee Canvas Wall Art Set These captivating colorful pieces portray the vastness of the African plains. 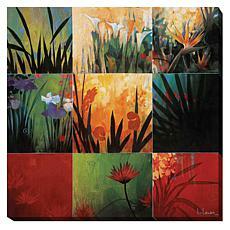 What a wonderful way to enhance your home or office décor with this gorgeous gallery wall art. 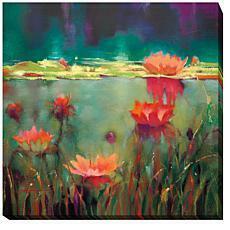 So Suddenly VI by Kelsey Hochstatter Gallery-Wrapped Giclee Canvas Wall Art This captivating colorful piece beckons a calming barefoot walk on a quiet beach. 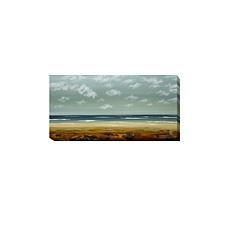 What a wonderful way to enhance your home or office décor with this gorgeous gallery wall art. Tropical Nine Patch by Don Li-Leger Gallery-Wrapped Giclee Canvas Wall Art This captivating piece showcases a vignette of nine floral scenes with colorful panache. 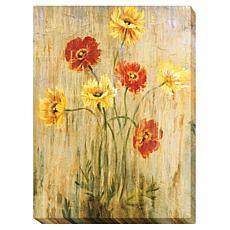 What a wonderful way to enhance your home or office décor with this gorgeous gallery wall art. Tropical Nine Patch II by Don Li-Leger Gallery-Wrapped Giclee Canvas Wall Art This captivating piece showcases a vignette of nine floral scenes with colorful panache. 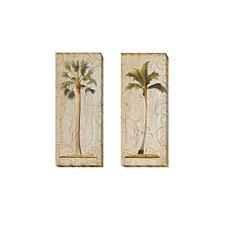 What a wonderful way to enhance your home or office décor with this gorgeous gallery wall art. Parade by Don Li-Leger Gallery-Wrapped Giclee Canvas Wall Art This captivating piece captures a parade of colorful flowers with floral flair. 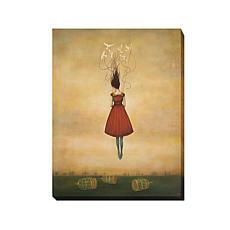 What a wonderful way to enhance your home or office décor with this gorgeous gallery wall art. Shoreline by Karen Lorena Parker Gallery-Wrapped Giclee Canvas Wall Art This captivating colorful piece elicits a sense of easy-breezy beachside living. 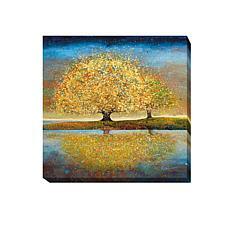 What a wonderful way to enhance your home or office décor with this gorgeous gallery wall art. Jenny Foster "Proud Mom" Gallery-Wrapped Canvas Giclee Wall Art Enjoy gallery-wrapped art for your foyer or any room in your home or office. This piece, by Jenny Foster, tugs at the heart strings of every animal lover. It's perfect for your favorite "pet person." 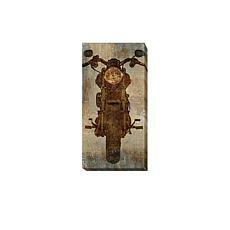 Straight Away by Matthews Gallery-Wrapped Giclee Canvas Wall Art This captivating piece beckons an exhilarating ride on a classic two-wheeler. 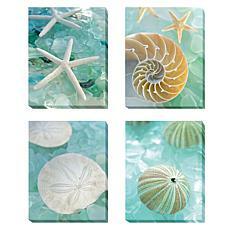 What a wonderful way to enhance your home or office décor with this gorgeous gallery wall art. 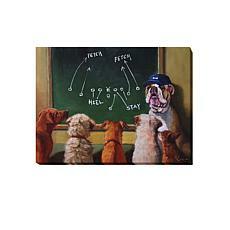 Jenny Foster "Play Day" Gallery-Wrapped Canvas Giclee Wall Art Enjoy gallery-wrapped art for your foyer or any room in your home or office. 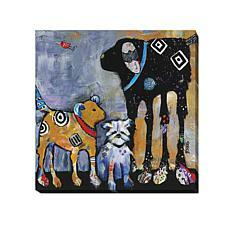 This piece, by Jenny Foster, is perfect for your favorite "pet person." What a quick and easy way to update a room. 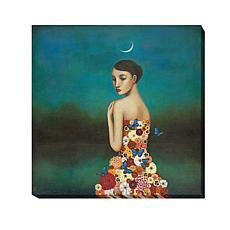 Reflective Nature by Duy Huynh Gallery-Wrapped Giclee Canvas Wall Art This captivating colorful piece elicits a sense of peaceful introspection. 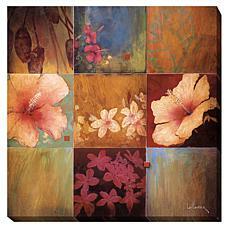 What a wonderful way to enhance your home or office décor with this gorgeous gallery wall art. 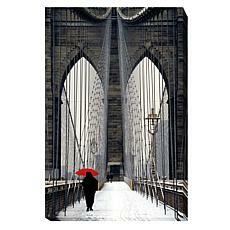 Cahill "Brooklyn Bridge Meets Red" Gallery-Wrapped Canvas Giclee Wall Art Enjoy gallery-wrapped art for your foyer or any room in your home or office. This piece, by Cahill, features a modern splash of color. What a quick and easy way to update a room. Laurie Maitland "Tobacco and Chocolate" 3-Piece Gallery-Wrapped Canvas Giclee Wall Art Enjoy gallery-wrapped art for your foyer or any room in your home or office. 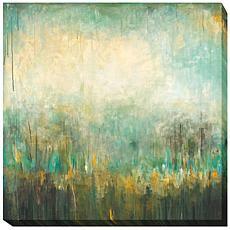 These pieces, by Laurie Maitland, each feature a mix of earthtones. 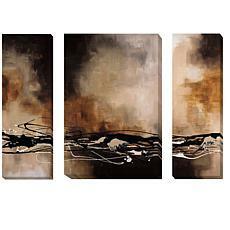 Think of the possibilities with three canvases. 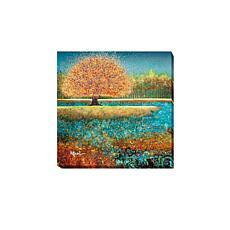 Julie Hawkins "This Year's Love" Gallery-Wrapped Canvas Giclee Wall Art Enjoy gallery-wrapped art for your foyer or any room in your home or office. 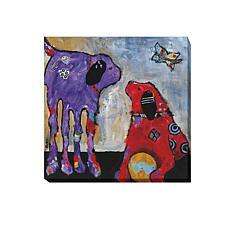 This piece, by Julie Hawkins, features a joyful burst of color. What a quick and easy way to update a room. Alan Blaustein "Seaglass" 4-Piece Gallery-Wrapped Canvas Giclee Wall Art Enjoy gallery-wrapped art for your foyer or any room in your home or office. These pieces, by Alan Balustein, each feature a lovely seashell. 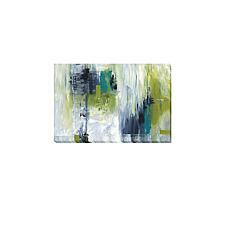 Think of the possibilities with four canvases. Joseph Wong "Silent Morning" Gallery-Wrapped Canvas Giclee Wall Art Enjoy gallery-wrapped art for your foyer or any room in your home or office. 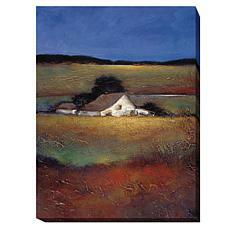 This piece, by Joseph Wong, depicts a country scene of subdued earthtones. What a wonderful way to update your space. 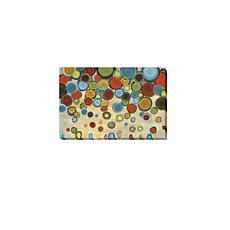 Jeni Lee "Retro Circles" Gallery-Wrapped Canvas Giclee Wall Art Enjoy gallery-wrapped art for your foyer or any room in your home or office. This piece, by Jeni Lee, features a burst of color. What a quick and easy way to update a room. Liz Jardine "Poppy Serenade" Gallery-Wrapped Canvas Giclee Wall Art Enjoy gallery-wrapped art for your foyer or any room in your home or office. 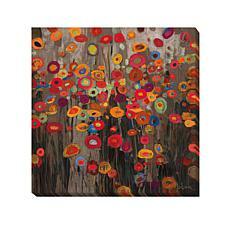 This piece, by Liz Jardine, features a delightful bunch of poppies in natural colors. What a wonderful way to update your space. 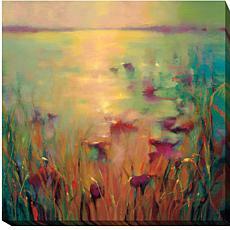 Morning by Donna Young Gallery-Wrapped Canvas Giclee Art The peaceful colors and quiet of the morning are highlighted beautifully in this piece. 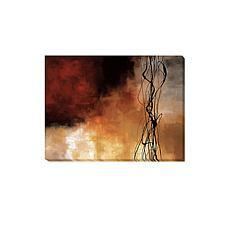 What a wonderful way to enhance your home or office décor with this dramatic gallery wall art.